Editor’s note: Today as we celebrate the 40th anniversary of man’s first steps on the moon, our thoughts often turn to the heroic astronauts who walked on lunar dust. 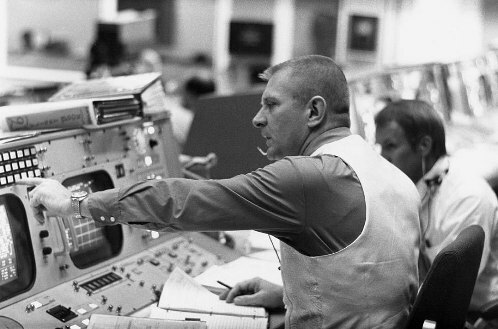 But the men on the ground were just as essential to the success of the landing, maybe none of them more than Gene Kranz, Flight Director not only for Apollo 11, but the near tragic flight of Apollo 13 and many more. Today, AoM reader Colin Pesyna illuminates some of the great lessons we can learn from one of the most excellent leaders in American history. Thanks for this great post, Colin. I am among the many who consider the exploration of space to stand superlative among mankind’s achievements. Of the great many men and women involved in the history of our species’ excursions into outer space, NASA flight director Gene Kranz time and again distinguished himself as remarkable leader. His oversight of the dramatic Apollo 13 mission is perhaps his most well known achievement, but it was under his watch that NASA rededicated itself after the tragedy of Apollo 1, achieved its aim of a lunar landing on Apollo 11, and took some of the first steps towards a long term human presence in space with Skylab. There is much to be learned about personal integrity and leadership by studying the conduct and attributes of this great man. Spaceflight is a dangerous and exacting business. Irreversible decisions must often be made with incomplete information and under strict time pressure. Often the success of the mission or the safety of the crew can depend on these single moments. Kranz was confident in his ability to swiftly and correctly come to understand the salient aspects of these kinds of critical problems. Like any great leader, he was able to synthesize the provided information into a course of action that would ultimately become a solution. And he was able to stay cool and collected as he did so. But while Kranz was a pilot himself and trained as an engineer, neither he nor any other single man could be expected to have all the abilities and knowledge necessary to make these decisions in isolation. Kranz was only 31 years old when he became NASA’s Flight Director. And the average age of the men of Mission Control at the time of Apollo 11 was only 26. Many older engineers didn’t believe that a moon landing was possible and didn’t have much faith in the future of space travel and thus the security of such a job. So Kranz led a group of recent college graduates, a crew that made up for their lack of experience with a dedication to make the project a success. Kranz had faith in them to do their jobs, voice their concerns, and give their honest assessments of the situation at hand. His faith in them gave them faith in themselves. His leadership united the team and filled them with a sense of intense drive and great purpose. They all knew that under his watch, failure was not an option. During the initial moments after the explosion on Apollo 13, Mission Control was working furiously to make sense of what was happening. New failures and alarms were occurring with each moment, and every engineer on duty was desperately trying to make sense of the tide of information. Kranz, as Flight Director, had the responsibility of understanding what his men were telling him and figuring out how to keep the crew safe and the mission on track. He was also tasked with keeping his men focused on their jobs, ensuring that he and his team fulfilled their duties efficiently and correctly. As the astronauts lost oxygen and electrical power for reasons that had yet to be identified, Kranz’s voice cut through with a simple command: “Okay now, let’s everybody keep cool. Let’s solve the problem, but let’s not make it any worse by guessing.” Listening to the flight control recordings, I am amazed and the calmness in his voice. Kranz is thinking clearly, and his voice does not betray any fear or sense of panic that he might be feeling. Being this kind of anchor in the storm gives those around you the confidence to stay level-headed too. Always be in control of yourself and remain in the moment. After attaining some great accomplishment, some men are content to rest on their laurels and live out their days basking in the residual glow of that success. True leaders, on the other hand, are always anxious to be pushing forward; they want their legacy not be used as fodder for history books, but as a springboard for others to continue to press onwards and upwards. While the 40th anniversary of the moon landing is a big to-do, Gene Kranz almost didn’t come to the celebration for it in DC. For him, these reunions are bittersweet. Ten years ago he said, “Three decades ago, in a top story of the century, Americans placed six flags on the Moon. Today we no longer try for new and bold space achievements; instead, we celebrate the anniversaries of the past. The stagnation of the space program over the past decade has done nothing to ameliorate these feelings. He said recently, “Basically, I feel sad. And I think everybody up there (from the Apollo-era NASA contingent) will express pretty much the same thing. Here we’re now 40 years after our first lunar landing, and the next lunar landing is nowhere in sight.” A leader is man who is always anxious to look to the future, not to the past. While Kranz has much to teach us about leadership, determination, and substance of character, he was also no slouch when it came to style. His wife, Marta, would provide him with his trademark white vest, emblazoned with the mission patch for that flight. This signature of fashion remains a piece of NASA folklore to this day. Additionally, Kranz’s flattop haircut was a staple of his appearance. Whether consciously or not, Kranz’s cultivation of a unique image served to make him one of the most recognizable men in the space program. A man should strive to adopt a style that will remain invariant over the transformations of fashion, and develop aspects of his personal appearance that will be singularly associated with him. On January 27th, 1967 Apollo 1 astronauts Gus Grissom, Ed White, and Roger Chaffee died in fire during a training exercise. The following Monday, Kranz addressed his team, delivering what became known as the Kranz Dictum. Although it is directed at the members of Mission Control, Kranz’s words transcend that narrow audience. His will to honesty, purpose, and perfection are the heart of this man’s lesson to us all. I urge you to read his words in full. Pay close attention to his unequivocal sense of personal accountability and the clarity of his demands that he and those who will work under him will hold themselves to only the most exacting standards. The speech is brief, but rich. Its two paragraphs contain great lessons. “Spaceflight will never tolerate carelessness, incapacity, and neglect. Somewhere, somehow, we screwed up. It could have been in design, build, or test. Whatever it was, we should have caught it. We were too gung ho about the schedule and we locked out all of the problems we saw each day in our work. Every element of the program was in trouble and so were we. The simulators were not working, Mission Control was behind in virtually every area, and the flight and test procedures changed daily. Nothing we did had any shelf life. Not one of us stood up and said, ‘Dammit, stop!’ I don’t know what Thompson’s committee will find as the cause, but I know what I find. We are the cause! We were not ready! We did not do our job. We were rolling the dice, hoping that things would come together by launch day, when in our hearts we knew it would take a miracle. We were pushing the schedule and betting that the Cape would slip before we did. The film Apollo 13 represents a true story of great leaders being able to beat incredible odds. The failed mission put both the ground and flight crew in a terrible situation that could have easily broken any leader; however, the leaders refuse to be broken and successfully lead the astronauts back to safety. In the movie, there are great examples of leadership from Flight Commander Jim Lovell and Flight Director Gene Kranz as they navigate this intense mission. Flight Commander Jim Lovell is a great leader because of how capable he is of creating a vision. Before it was announced that he would command Apollo 13, he clearly is passionate about being one of the first men on the moon. He sets his vision the night he watched Neil Armstrong take the first steps on the moon by shutting one eye and holding his thumb aimed at the moon. His strong vision allows him to maintain high morale in his team throughout the initial stages of the flight when there were a few minor issues. However, when necessary for his crew’s survival, he switches his vision to getting home safely. Although, he is fervent about visiting the moon, he is the first of the crew as they sadly pivoted around the moon to lead the change in vision, again, putting his thumb over the earth. Flight Director Gene Kranz demonstrates the difference between being a leader and a manager. To fulfill his role, he has to appropriately manage all of the scientists and crew on the ground while simultaneously leading the mission. Kranz does not accept the status quo, by refusing to believe the astronauts would not make it back when the odds of the crew’s survival are incredibly low. When President Nixon sends a man asking for the odds of survival, Kranz in front of the team loudly declares, “We will get them all back.” This ultimately allows him to effectively lead the team. In order to accomplish this goal, he did not rely heavily on existing systems or structures but rather he trusted those around him by giving them an ambitious goal and motivating them to achieve it. Both Flight Commander Jim Lovell’s vision and Flight Director Gene Kranz’s ability to lead rather than manage flows directly into the idea of getting people on their side. Although these characters are completely different, they both are able to have their crews completely on their side. At no point did either of these leaders have their teams lose trust in them. If both teams were not fully on board, the incredibly low odds of the team’s survival would have been even lower. These two leaders truly understand this; even though they apply a lot of pressure to their teams, it was never too much that their teams faltered. The leaders in Apollo 13 set a vision, lead instead of managed, and keep everyone on their side which ultimately allows them to safely beat incredible odds and get the crew home safely.